A Squidge near the letter "C" in Donkey Kong Country (GBC). 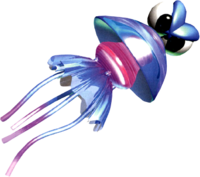 Squidges are jellyfish enemies from Donkey Kong Country who have large eyes on top of their heads. They only appear in the underwater levels Croctopus Chase and Poison Pond. They are not very aggressive, as they simply only swim from side to side in a basic pattern, making them easy to avoid. Sometimes they move in a quicker pattern in later levels in big groups. Enguarde the Swordfish is the only thing in the game able to defeat these enemies, who the player can use to defeat Squidges by stabbing them with Enguarde the Swordfish's bill. During the ending credits of Donkey Kong Country, a Squidge can be seen chased by a Chomps Jr. in DK's Tree House, but later a group of four Squidges reappear chasing the Chomps Jr.. In the Game Boy Advance remake of the game a Chomps replaces the Chomps Jr. that chases the Squidges in the end credits. In the remake the event occurs under Gangplank Galleon. Many of them also appeared in Club Nintendo's comic adaptation of the game, trying to attack Donkey Kong and Diddy Kong. Squidges are one of the only enemies from Donkey Kong Country not to reappear in Donkey Kong Land. ↑ Donkey Kong Country Nintendo Player's Guide, page 18. This page was last edited on March 8, 2019, at 08:58.